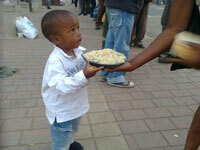 In an effort to reduce extreme poverty and hunger, ROKPA has been running a Soup Kitchen in Johannesburg for 20 years. 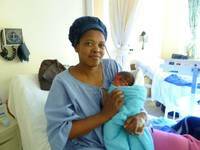 The other ROKPA Projects in South Africa also focus on nutrition and self-sufficiency. South Africa's economy is in bad shape: The extremes of wealth are stark - in 2011, Statistics South Africa estimated that in the city of 4.4 million South African citizens, 1 in 4 people of working age was unemployed. Opportunities to earn money can be found in agriculture and mining slate, but the wages are extremely low. The local population suffers from poverty and hopelessness and drug addiction is widespread. In addition, studies have shown that children in this region are often abused – affecting about 60% of the girls and 40% of the boys. In hardly any other country on Earth so many girls and women are raped as in South Africa, with many victims not only suffering psychologically from the consequences of the abuse, but also becoming infected with HIV at the same time.